All 11 teams in Podgorica have just one game left in the preliminary round and with the top two teams in each group going straight through to the semi-finals, only one team is unknown still. In group B, hosts Montenegro and Latvia cannot be caught in first and second place, but while Czech Republic confirmed their first place in group A, Austria in second place on seven points can still be caught by Netherlands, on five points, after the two sides drew in their match. All games will be live and free on ehfTV.com, alongside a wealth of statistics on the official website and a live ticker. On the official website highlight videos for all matches are available. Jon Muqolli put in one of the most impressive individual scoring performances for Kosovo as his 14 goals saw his side beat Moldova 32:26, but a 24:18 loss to Austria in their following match saw them knocked out of contention for a last four spot. The win for Austria saw Marin Kopic score seven times for them, but it came after his side drew 25:25 with the Netherlands in their previous match in a frantic game full of incident and 13 goals from his teammate Marc Andre Haunold. The Czech Republic did not waste any time ins confirming their top spot in the group, beating Bulgaria by nearly 20 goals (36:18) and then Netherlands 27:24 as they made it four wins from four. Moldova beat Bulgaria 28:24 in the remaining match, with the winners ensuring they did not finish in last place. With two clear wins in their last two matches, hosts Montenegro ensured their place in the semi-finals on home ground. 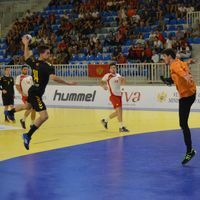 First, their 35:28 (17:14) win over Turkey saw them three ahead at the break, despite the best efforts of Doruk Pehlivan, who scored 10 goals for the Turkish side, coached by Murat Bilge. But eight goals from Branko Vujovic ensured the hosts had one foot in the semi-finals. Their other foot was firmly planted there two days later when they dominated Slovakia in the second half to win by 10 (31:21) – one more than the amount of goals that Vasilje Kaludjerovic scored for the host nation. Latvia already had four points by the time their third game came around and their six-goal (26:20) victory over the Georgians confirmed the semi-final spot, although Daviti Koriauli ensured he kept in the hunt for the top-scorer prize, scoring nine for his Georgia side who finished their campaign with that lost to end pointless after four games – Koriauli had also scored 11 goals for Georgia in their 31:25 loss to Turkey the previous day, but like Slovakia, they cannot progress any further and will play tomorrow for third place with both on two points. Moldova’s Roman Dodica now tops the list of best strikers in Podgorica with 45 goals, leading Daviti Koriauli from Georgia, who has 42 strikes, Bulgaria’s Kristian Vasilev lies in third with 37. Before all the games in Montenegro yesterday there was a minute of silence in memory of the victims of the fires in Attica, Greece.